Israel's response has been criticized as "disproportionate," which betrays a misunderstanding of proportion's meaning. The goal of military action, when unavoidable, is not to take one life in exchange for each one unjustly taken; this is mere vengeance. The goal is to remove the conditions that lead to conflict and the taking of life. So far, Israel's actions have been proportionate to this objective. And the convoys of fuel, medical supplies and food sent by Israel into Gaza show an appropriate concern for Palestinian suffering, even during a broad assault on Hamas forces. Israel's immediate goal is simple: to stop missile barrages by Hamas on southern Israel. But it is not a coincidence that this action was taken by the primary sponsors of the peace process in Israeli politics. The Israeli public will not accept any further risks for peace as long as Hamas missiles fly. Those missiles are a daily symbol that Israeli territorial concessions result in the strengthening of committed enemies and the death of Israeli citizens. The removal of this threat is not an obstacle to the peace process. It is the prerequisite for the resumption of the peace process. It is also not a coincidence that the Israeli attack took place in the last days of a reliably favorable Bush administration -- for which the president-elect, above all, should be grateful. If Israel concludes the main phase of its Gaza operations by Inauguration Day -- as it seems to want -- this will allow Obama to renew a peace push with a fresh start and a large obstacle (hopefully) removed. But the risks are considerable. A repeat of Israel's 2006 experience in Lebanon would be a massive blow to the Jewish state -- a demonstration of impotence in the face of mortal threats. The Lebanon campaign did not fail because of international pressure and criticism. It failed because Hezbollah terrorists could credibly claim the victory of survival -- confirmed by a cease-fire that allowed their rearmament. Syria and Iran were strengthened -- not because of Israel's attack on Hezbollah, but because Israel didn't prevail. The Israelis have an advantage this time around. In Lebanon, Hezbollah received a flood of weapons and support from bordering Syria. In Gaza, arms smuggling has been a problem, but bordering Egypt is not pro-Hamas. Israeli air raids have been effective in destroying Hamas infrastructure, weapons stockpiles and smuggling tunnels. 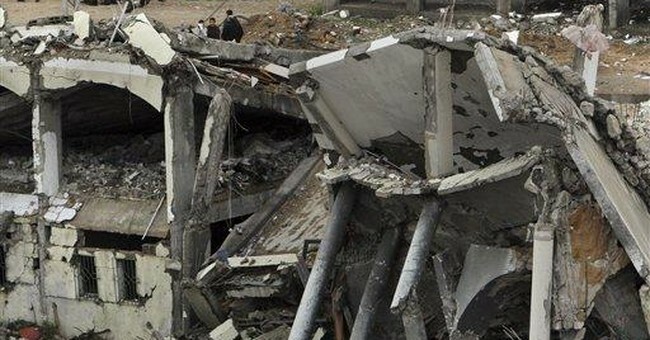 Israel recognizes that Hamas will claim victory no matter how badly it is damaged. But the real determination of winners and losers will come six months after a cease-fire. And there are two objective criteria of Israeli success: an end of rocket and mortar attacks on Israel and an end of large-scale arms smuggling to Hamas. What would be the shape of such a victory? That is not yet clear. Israel could reoccupy Gaza, overthrow Hamas and enforce its terms. But Israeli leaders, by most accounts, don't prefer this massive exertion, which also would imply that Israel's 2005 withdrawal from Gaza was a mistake. It is more likely that a ground invasion, if it comes, would last a matter of days. In this case, Israel would reserve the right to resume attacks in Gaza at any time after the conclusion of a cease-fire -- responding to every tunnel that is dug and every missile that is fired. And Hamas could, of course, finally observe a cease-fire that doesn't involve random attacks on Israeli families. In this crisis, Israel faces a test of its wisdom and competence: Would its leaders really have undertaken such a high-risk operation without a clear endgame? America, in turn, faces a test of its moral judgment. This conflict is not a contest between shades of gray in mist and fog. It is a matter of distinguishing between murderers and victims -- and of supporting an ally until a clear victory against terrorism is achieved.